This meteorite was reportedly found by Berber nomads in the northwestern Sahara in Spring 2013, and was subsequently sold by a Mauritanian meteorite dealer to a Moroccan businessman. The precise find location is unknown and no in situ photos exist. The specimen weighs 1,495 g, its maximum dimensions are 14.4 x 9.1 x 9.9 cm. Its shape is that of a flat pyramid with a trapezoid basis and gently arced lateral surfaces. The meteorite's vertical axis through its center of gravity is marked on its leading surface by an articulated apex that is slightly offset to the broader base. As a result of atmospheric ablation during a stable flight, the lateral surfaces are textured with an undulating pattern of almond-shaped regmaglypts and protruding ridges that radiate from the apex to the edge of the basis where lateral and the trailing base surfaces converge in a sharp angle. The resulting circumferential edge is intersected by the course of deep regmaglypts, the latter shaping an outline that resembles the folds of a silk robe. 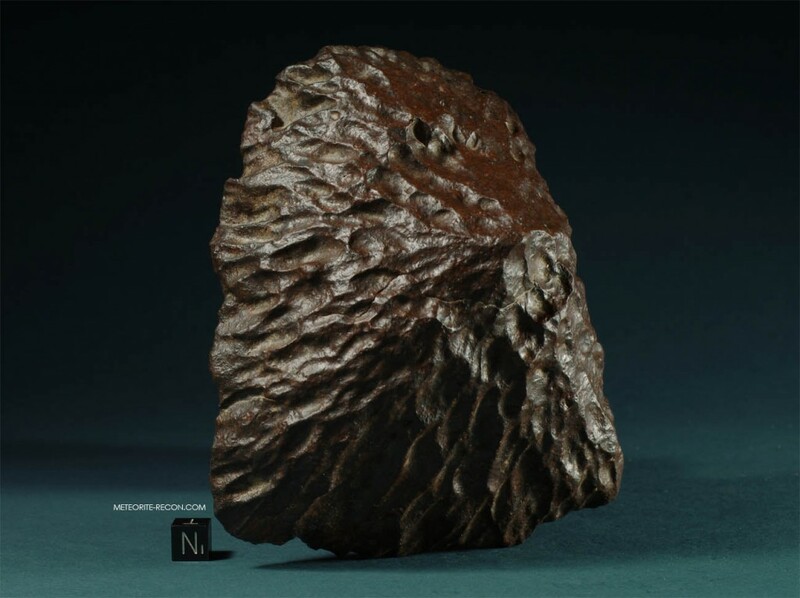 This meteorite was reportedly found by Berber nomads in the northwestern Sahara in Spring 2013, and was subsequently sold by a Mauritanian meteorite dealer to a Moroccan businessman. The precise find location is unknown and no in situ photos exist. The specimen weighs 1,495 g, its maximum dimensions are 14.4 x 9.1 x 9.9 cm. Its shape is that of a flat pyramid with a trapezoid basis and gently arced lateral surfaces. The meteorite’s vertical axis through its center of gravity is marked on its leading surface by an articulated apex that is slightly offset to the broader base. As a result of atmospheric ablation during a stable flight, the lateral surfaces are textured with an undulating pattern of almond-shaped regmaglypts and protruding ridges that radiate from the apex to the edge of the basis where lateral and the trailing base surfaces converge in a sharp angle. The resulting circumferential edge is intersected by the course of deep regmaglypts, the latter shaping an outline that resembles the folds of a silk robe. While the majority of the regmaglypts are elongated with a length/width ratio equal to or more than 3, a cluster of four circular depressions subjacent to the apex are an exception. Together they form a hollow that resembles a volcanic caldera. As a matter of fact the meteorite’s entire topography bears a striking similarity with the volcanic island of Stromboli off the Sicilian coast in the Mediterranean – which lead to the field name “Stromboli Stone”. The effects of atmospheric ablation are uniquely preserved in the specimen’s shape and texture, but the effects of terrestrial weathering are equally obvious: During the meteorite’s terrestrial residence the fusion crust has been replaced by a semi-opaque glaze of desert varnish, and only patches of the initial substrate that forms the underlying, semi-oxidized layer of the meteorite’s fusion rind, remain. Yet despite its extended ordeal on our planet’s surface, the meteorite has stayed entirely intact without even the slightest damage to its integrity. While very likely an ordinary chondrite, the meteorite’s unique shape excluded any destructive measures and so we refrained from removing a section for analysis and classification. In order to preserve the meteorite’s shape and texture, in case its future owner decides otherwise, a 3-D scan was performed and stereolitographical data was saved in STL-format. 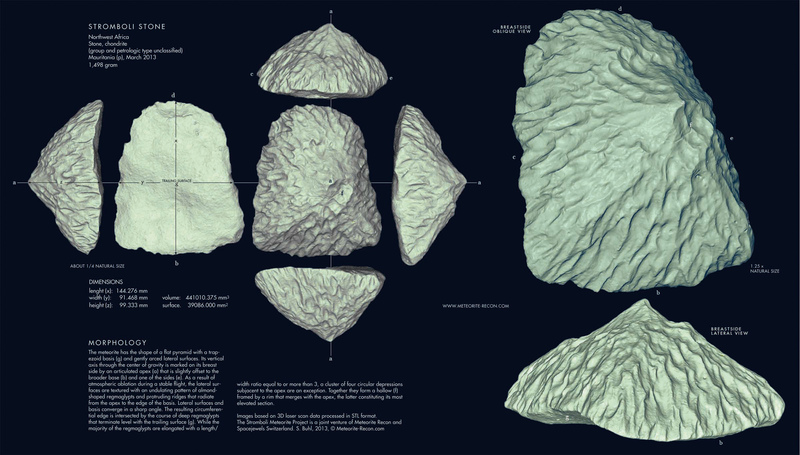 The virtual replica stored in STL-format allows in depth study of the morphology of the Stromboli Stone and enables further research, e.g. wind tunnel simulations and precise determination of the meteorite’s drag/shape factor. 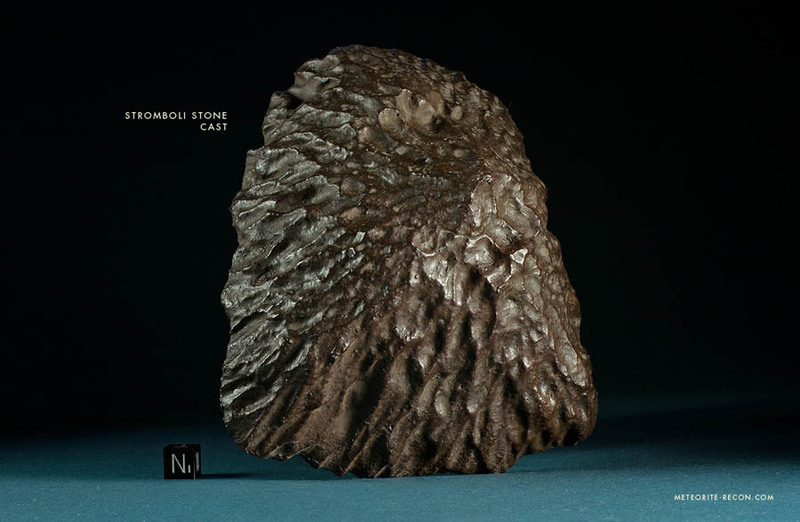 In order to enable a broader public to appreciate the exceptional shape of the Stromboli Stone, it was decided to produce a set of replicas of the meteorite. Since 3D printing is currently enjoying an increasing popularity we considered this technology as well. 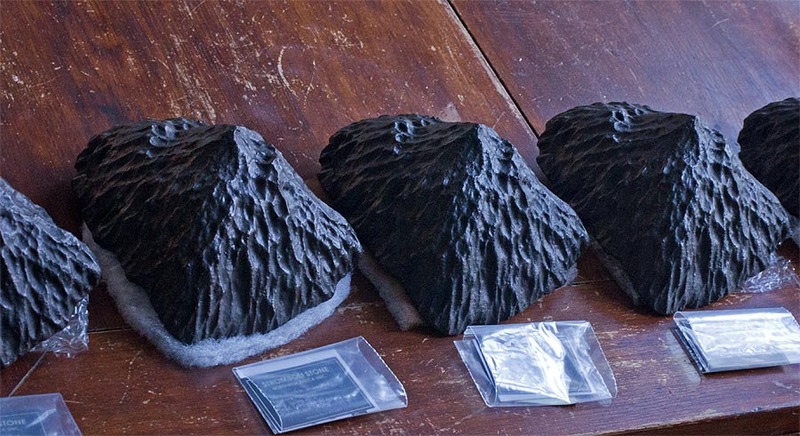 However, beside its great advantage, 3D printing is not yet the first choice when it comes to produce realistic meteorite replicas. In regard to authentic surfaces their layer-by-layer technique of manufacturing is in fact a great disadvantage. The resulting matt finish with rough layer lines all over is as far from a desert meteorite’s natural surface as a cut surface is from a polished one. Of course, there is always the possibility of post-processing but in this case the meteorite replica will loose considerable detail. Instead of using 3D printing, we chose to have a set of ceramic casts manufactured by the way of silicone moulding. The latter being not only the most traditional approach, but still also the most accurate and realistic. 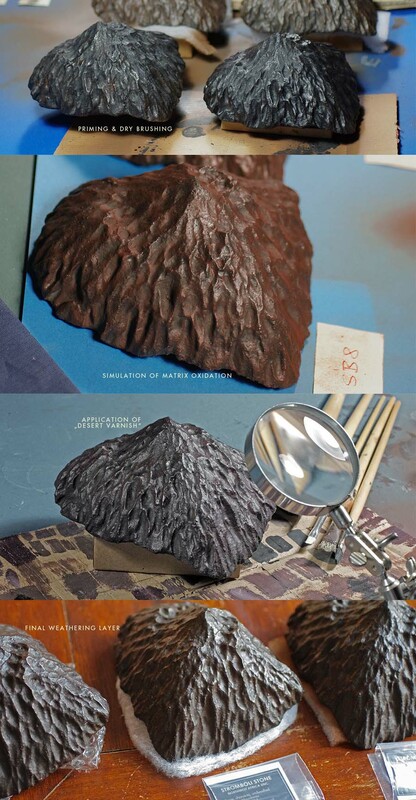 After cleaning the meteorite with isopropylic alcohol, a mould was prepared by successively applying layers of latex to the meteorite. Then, after 48 hours of drying, the mould was peeled off and reinforced with a wooden box. Because the final casts should not only match the shape but also the exact weight of the original, density tests were performed with the ceramic casting medium, and a lead core was embedded in each cast. Four prototype-casts were produced in an atelier in Augsburg, Bavaria, before the results matched the comprehensive quality requirements. 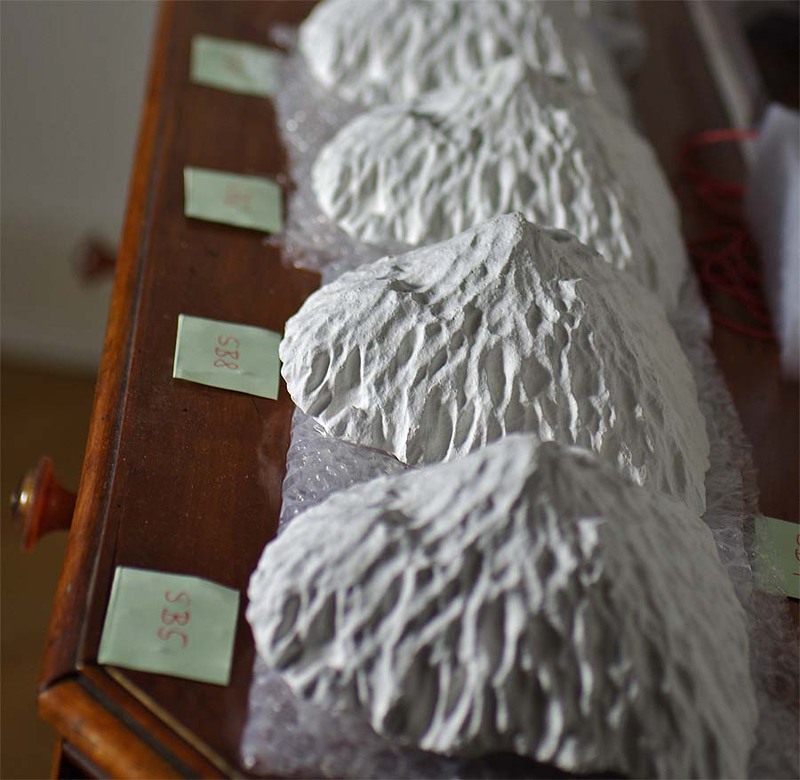 Then, in May 2013, the actual production of eight casts began and was not completed before mid-June and after an extended drying process. The production of the casts itself was rather a technical affair, which we had wisely left to experts with experience in this field. The application of an authentic coloring that would precisely match the original, instead was a rather artistic challenge. This task we had to take upon ourselves, simply because no one we knew of, had ever painted the cast of a desert meteorite. In principle, the task was to simulate the various processes of atmospheric ablation, surface oxidation as well as the effects of chemical and mechanical weathering that had affected the meteorite’s surface color and texture during the time it spend on a Hammada or Erg in the Mauritanian Sahara. This included not only the imitation of the thin glaze that forms on a meteorite’s surface from the ceaseless impact of minute saltating sand grains, but also the simulation of the semi-opaque lustre of the desert varnish, which, to make things worse, forms more distinct on protruding edges than on the bottom of the regmaglypts. The approach developed to reprodruce this multi-dimensionality in a color scheme consisted of the subsequent application of thin coatings of pigment, each of which represented one stage of the processes described above. The materials used were enamel and acrylic based colors, the individual steps included priming of the casts and applying of a base coat that matched the substrate, which is the semi-oxidized matrix layer underlying the fusion crust. This was followed by a rust-wash that mimics matrix oxidation, and a sprayed layer of semi-opaque “desert varnish”, which in turn was followed by the application of “dried dust” in the shape of pigment powders applied with turps, most of which was brushed off after the drying of the turpentine in the next step. The final measures consisted of alternating steps of dry brushing and shading with wash, the latter is a thin coat of paint made up mostly of thinner and very little pigment. Each step required a 24-hour drying period, which made the coloring a time-consuming affair. However, tests performed in which seasoned meteorite collectors mistook casts for an original meteorite, proved that the effort was successful.